What You'll Need: scriptures, printed emotion faces, 6 Popsicle sticks, white glue or scotch tape, black fine point marker . You can CLICK HERE to download the pdf of this lesson for easy printing. If you download, please leave a comment here on what you like about this lesson. CLICK HERE to download file. 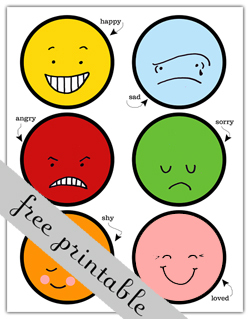 Print emotion faces onto card stock. Cut out each face. Using tape or glue, adhere faces onto Popsicle sticks. Use a marker to write the emotion onto each stick. Before we lived on earth we lived with our Heavenly Father. Our spirits were alive and already had feelings, thoughts and emotions. Feelings are a very important part of our life. There are many different kinds of feelings and every single feeling we have is important. Good feelings can make our families stronger. Warm feelings from the Holy Ghost can help us know when we hear the truth. Bad feelings can help warn us of danger or let us know when choices we make are not good. Every day we feel lots and lots of different feelings. Here are just a few. Now I am going to read a story. As I read, hold up the feeling stick you think goes into the story. Becky woke up in the morning. Today she was going to the park to play with her friends. That made her feel so __________. She rolled out of bed and started to put on her clothes. She looked out her bedroom window and saw dark clouds and lots of rain. Oh no! She would not be able to go to the park! She felt so ___________. She put on her clothes and headed downstairs. As Becky was eating her breakfast her mom was making cupcakes. "Can I have a cupcake for breakfast?" Becky asked. "No. These are for your sister's party." said her Mom. Becky felt very ____________. She wanted a cupcake and it was all her sister's fault. When her sister came to the table Becky let her ___________ feelings get bigger and bigger. She reached out and pulled her sister's hair. Her sister began to cry. "Oh no." thought Becky, "I really hurt her". Becky felt really __________ for what she had done. She apologized to her sister. Becky went to school. She got to sit by her very best friend, Emily, on the bus. She felt __________ as she rode to school. When she got to school and headed into class her teacher was not there. Instead Becky had a Substitute Teacher. The new teacher asked Becky what her name was. Becky stared at the floor. She felt very __________. But her Substitute Teacher was so nice that soon Becky didn't feel __________ anymore and she talked and played like she normally did. At recess Becky wanted to play with some of the girls from her class. When she went up to them they told her she couldn't play with them. This hurt Becky's feelings and made her so __________. She began to cry. Emily saw her crying and came and hugged Becky. That made Becky feel __________ and __________. After school Becky had her favorite snack waiting for her at home. She was __________ about that. She played nicely with her sister and got ready for bed all by herself. Her mother and father kissed her goodnight and Becky felt __________. Before getting in bed Becky knelt by her bed and said her prayers. As she prayed she felt warm in her heart. When she prayed she always felt __________. Learning which feelings we have and how to handle those feelings is an important part of life. Our hearts and spirits and feelings are a gift from Heavenly Father that we can learn to use well. We should especially learn to listen to our feelings when we are in church, prayer, reading scriptures or spending time with our family. These are some of the times when the Holy Ghost uses our feelings to tell us about what is true and will make us happy. Bear your testimony about feelings. Tell your children how you feel when you spend time together as a family, read your scriptures and attend church. Tell your children they can always share their feelings with you and you will listen. Practice Song: If you are teaching your family the JUNE Song of the Month, go over the words and music with your family. - Mix cream cheese, mayo and ranch powder until well combined. - Chop an assortment of veggies into small pieces. We use tomatoes, carrots, cucumbers, broccoli, peppers, green onions, cauliflower, etc. (You may also choose to add shredded cheddar cheese). - Spread 1 Tbsp of cream cheese spread onto each english muffin half. 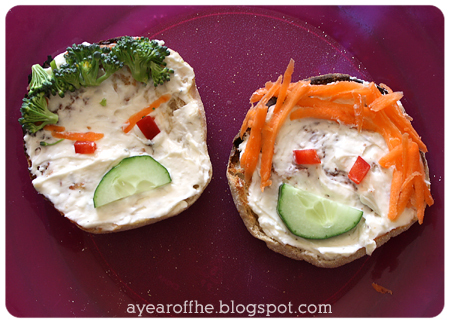 - Have kids decorate their muffin with veggies to create a face with an emotion. This can be one they choose or assigned (since most will automatically choose a happy face). - Eat up and love that your kids ate their veggies. * Of course you may choose to use low or non-fat cream cheese and reduce or omit the mayo for a healthier version. This one is perfect for my girls, I'm waiting patiently for the pdf to be updated so I can get it ready for our family! Thanks so much for sharing these, it's a HUGE help! Very cute, my 3 year old will be helping with the lesson tonight. This will be perfect. Thank you. I am so excited to give this lesson! it's definitely something we need to talk about in our family. Thank you for all you do! i love love love your blog and i share with everyone i know. thank you for making my life 1000x easier!!! Thanks for the lesson! We just moved cross country, so are a little behind schedule (so I'm just now downloading this one!). My kiddos will love using the little feelings faces! Thank you so much for the lesson..can't wait to do it tomorrow! i hope you are getting lots of blessings for this service you are providing for so many families. thank you for such a wonderful resource. My baby loves to make faces for different feelings so he should even enjoy this! This is great. Thanks for all your great ideas! Thank You!! I have been looking all over the internet for a lesson like this!! Your website is great! Keep up the awesome work, it is so helpful and appreciated! This is perfectly age appropriate for my 2 year old. The 4 year old will love it, too. Thank you! All feelings are important. Looking forward to doing this lesson with my 2 yr old as well. Needed to review appropriate ways to show emotions combining a couple of lessons hoping to help my 6 and 3 yr olds. Thanks so much for this lesson. I love that I can come here and find whatever I need to teach my kids that week. I am so grateful for this website! Best Help I have found for my lesson in Primary lesson manual one, "I Have Feelings" My sunbeams are going to LOVE this lesson! Thank you for sharing! I just came across your site thru Pinterest and I'm excited to put your lessons to use! Thank you SO much for all your hard work! thank you again for the downloads. I am hoping your lessons can help my children better understand how their choice effect others as well as understand the choice have consequences and sometimes those consequences are not always the most fun. We have been having some trouble in our house with temper tantrums lately. This family home evening was perfect tonight. Thank you. This is exactly what I was looking for today, thank you! Thank you so much for this website and all the very hard work you have done on it! I love this lesson.